I've been working on my Beyond Love t-shirt, which I designed and was originally published as Hearts on a String. I'm using the original yarn, which is discontinued. I knit the original in red SWTC Beyond, a thick thin cotton tape yarn. I knit the 2nd in white for the magazine. They now suggest SWTC Phoenix as the recommended yarn. I'm using purple Beyond. I'm up to the armholes. It was started last September. 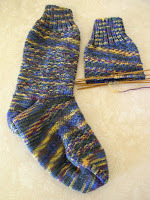 (Isn't Ravelry wonderful for aiding memory?) I put it aside for things like Christmas knitting, but picked up when simple stockinette knitting was needed. It went to hockey games, etc. It went to Boston with me. 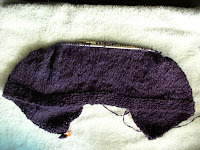 I was trying to make sure where I was in the pattern, (the yarn is not easy to read), when I measure the width. Boy did I have width!!!! As I talked on the phone with DH, what you see here reverted to yarn. I also double checked my measurements in my sweater generator program, and adjusted those. Now that the weather has warmed up, I'm anxious to wear it. The knitting is fairly simple, but keeping your place in bumpy, dark colored yarn is not. I'm doing better now that it is my primary project. My other project is socks, no surprise. This pair is for DSIL the trucker, and another Christmas present. The pattern is Crusoe from Knitty by Marilyn Roberts, because they are stranded. The yarn is from Herrschner's, bought on sale a couple of years ago. I've been helping the daughter of a long time customer with a history project. She's 11 years old, and likes sewing, but has no help at home. This didn't have to fit anyone, it was labeled a museum piece. She did most of the work, but I helped where needed. As you can see, she is thrilled. There were times when she doubted that she'd be able to finish it. The work load is slowing down, and I'm looking forward to sewing a blouse for myself. It's been cut out for a couple of months. I had a little time at the end of one day and got that much done. These lovelies are the first I've seen this year. I'm sure I walked right past them many times. Most lawns are mowed and weed killed and all that stuff. 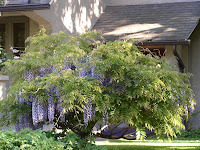 We pass this wisteria on our evening walk. For some reason I hadn't seen it in other years. Dog walking is meditation time for me, where my mind wanders with few distractions. 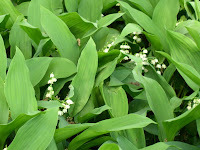 I've always loved Lilies of the Valley, since I was a little girl. They grew at the rental house we lived in then. No houses since then have had them. I have lots of shade n0w, and they would do well here. Just have to find some for me. This patch is a dog walk picture.